I do a lot of work in Coppell. Here are a few jobs that stick out to me. One is just gorgeous on a high end corner home off Bethel Road. The other is one I used in my blog on heat that comes through aluminum windows. If you live in Coppell this is probably what you have now and it's probably why you're here. Cheap builders grade aluminum windows let a lot of air, and heat, and cold through due to air leakage, conduction, and convection, as well as heat transferance from the clear glass which lets in 80% of the heat as a rule. This is a favorite supplier of ours. The Alside Mezzo can have some mixed reviews but here's the story. One of the cheapest window installation providers out there uses their double hung. They have some bad reviews because the installers are underpaid to accomodate the super low price point. Bad installers who are in a hurry make the house, and the contractor, and the windows look bad online. 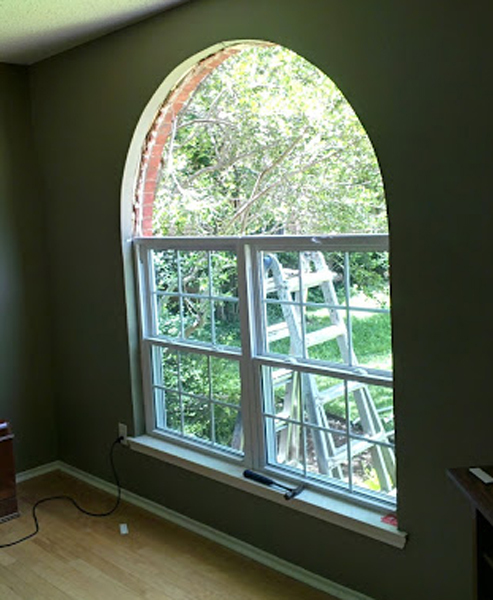 There are also a lot of window contractors that want it to look bad in order to sell their product. I like the window itself in a single hung, not the double hung. It has a U value at .26 or .27 which is about 10% lower than many comparable windows. They also have several glass packages and we use the highest performing double paned package. It's a good window when installed by the right installer. It also has more of a blueish grey color to the PPG Low E glass instead of the green we see in the Cardinal glass packages. On this one we used awning style over single hung. This has become a great style trend and allows ventilation from the top while still having a nice view down low. On this one we put in a few grids to give a country estate feel to the tall windows and get away from the modern look of super tall windows with grids. This one was off Sandy Lake Road in Coppell and the look was very relaxed with the Clay colored interior and exterior. This one was a beautiful project and in fact was done more than 7 years ago around 2006. I firmly believe that when a customer follows good advice we get timeless results. Not all houses have great changes and options available but many do. The move towards no grids on sides and rear of the home and the tendency to remove operators that kill the look of the back living room and hinder the view of the pool and the landscaping is all part of the move towards a more design savvy home design in remodeling and that includes vinyl replacement windows. We use mid range cost windows as a rule. Higher end ones may have triple glazing with Krypton Gas but that's a bit of overkill in Texas. While we use that exact frame and the upgrade is available, we find it lowers the U Value but not the Solar Heat Gain Coefficient. Double Pane with Argon gets the SHGC to .21 which is as low as the industry can offer and in Texas it's the most important performance criteria. Lower U value would be of benifit if we lived in North Dakota but here it's hot only until the sun goes down and the average temperature then is back into the 70's. Conversely even on the coldest night, the sun comes out and warms things back up the next day. We don't have long periods of heat or cold that necessitate U values to be in the .16 range. Shutters also show here in this shot that grids are often not a good visual anymore. If needed for curb appeal they are good and the cost difference is minimal but in many cases we update the look considerably by removing grids altogether. One of the main reasons we use Alside and NT Window products is that these have a full thickness mid range window with a front to back depth of 3 1/4" but they have a minimal frame from brick to glass. This maximizes glass while minimizing frame. 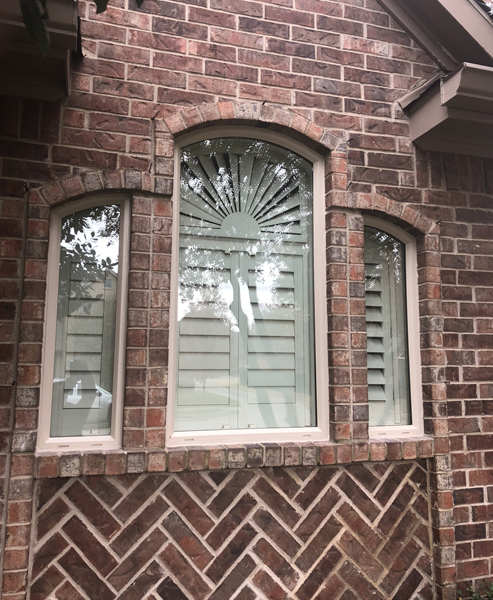 Most inexpensive windows available in Coppell have either a frame of 3 3/4" brick to glass or are very cheap builders grade windows. Vinyl windows, Coppell, Texas, Replacement Window, NT Window, picture windows, Low E Glass, ArgonContact us! These are Alside Mezzo Vinyl Single Hung and Picture Windows in Clay color. Sometimes called Adobe or Sandstone, it's a fairly new window color that isn't Tan or White. On this shot we see a little different grid configuration than the typical colonial grids. In recent years many homeowners and designer have gone to fewer grids. You can see a before and after shot of this one on our Window Results page. Grids can actually change the performance too. More grids make less solar heat gain, which can be a good thing but most homes have grids in the front only now instead of all over the house. 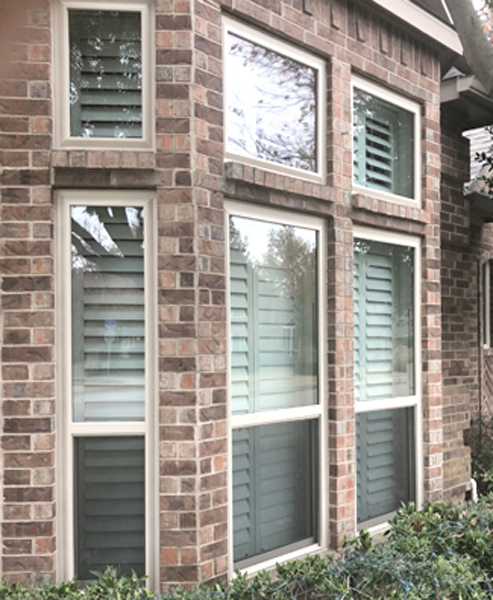 Most of the homes in Coppell do need new windows. You can replace the glass only but it doesn't address the metal window frame which conducts heat and cold or the aged weatherstripping which can't be replaced. Also, the frames themselves tend to bow with the settling of the house and often this makes them leaky and inefficient. Vinyl has more give and can move with the home and because vinyl replacement windows are downsized to fit inside the brick with some room to clear it, they aren't being moved around by the natural movement of the soil from season to season. This is a nationally known window but some of the reviews are mixed. Here's why. The window is not the sum total of the project. The expertise and the level of skill of installation is really the most important thing in a replacement window job. Smaller frames certainly look better to some degree but not in the nicest of homes. Some depth and look of stability is better and the added girth can also look more structurally sound. No one wants to lose too much glass but a frame that is too small or too flat with no dimension or texture and carachter is a bad look as much as a frame that is too fat and detracts from the home. This manufacturer has night latches for the interior and can provide an added layer of security by allowing the window to open four inches without opening all the way. While not really a security latch as the guy who wants in bad enough can come through any window at any cost, it adds a peace of mind on those cool evenings when ventilation is desired. The beige color is also a bit different. Many beige and tan windows seem to have a yellowish tint. These are grey based and far more neutral in their overall color scheme. Exact measuring is a skill in and of itself as well. Better manufacturers produce windows within an eighth of an inch and getting a perfect size is part of a perfect window installation. 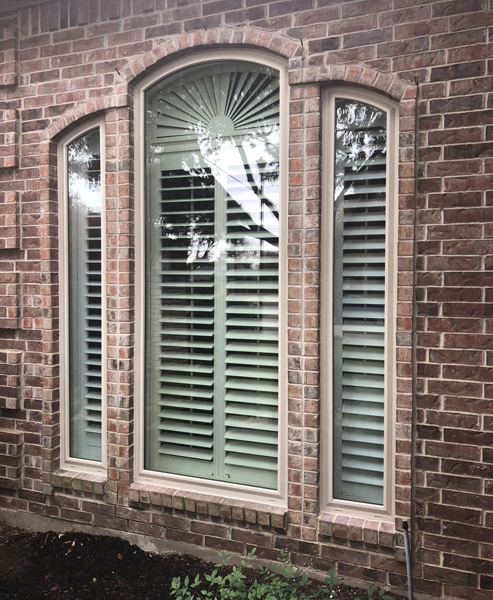 Our sidelite windows in Coppell are usually pretty narrow. Getting a good look at the front door can be a challenge. In many cases this variable alone will steer us towards a specific window manufacturer that has a Slim Line Vinyl Replacement Window frame but this one is a standard picture window. Here too we see that shutters make grids less necessary and often less appealing. 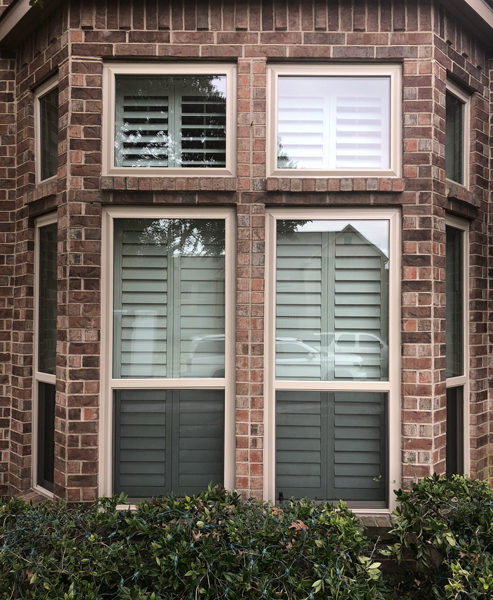 Shutters are actually more expensive than windows and in these cases it certainly looks better to have a clear view and let them shine through. Tint and color of glass can be a big concern. We have one of our ten different manufacturers that addresses this well with several options of Low E Glass that are less colorful. This is a big one with many of the ladies as the hard green color of Cardinal 366 Low E can be offsetting to many homeowners. Also this shot shows the more neutral and less staunch look of the beige and tan color over the white. White is most popular for sure but in higher end homes the more relaxed look can be preferable. We are very proud that our business model has very low overhead and advertising costs and we sell products that are, on average less than $650 each. This means they can increase home value more than they actually cost in most cases. This doesn't mean much until you sell the home but it's one of the main reasons we work with so many house flippers who work on higher end homes. 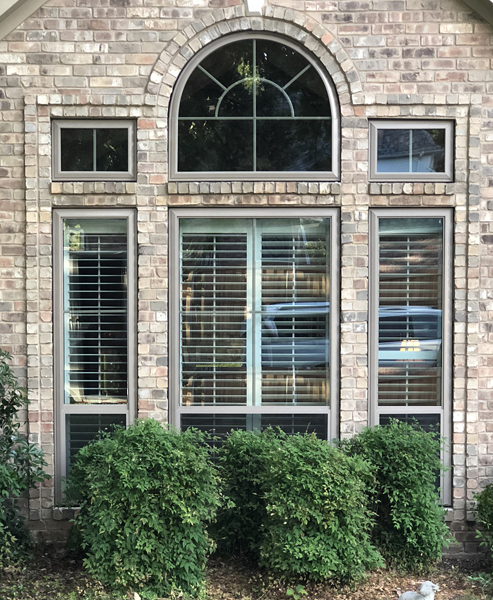 vinyl, window, windows, replacement, Coppell, Alside, NT Window, Don Young Company, Thermatru, entry systems, front doors, transomes, sidelites Contact Us! These are our slim line vinyl replacement windows. 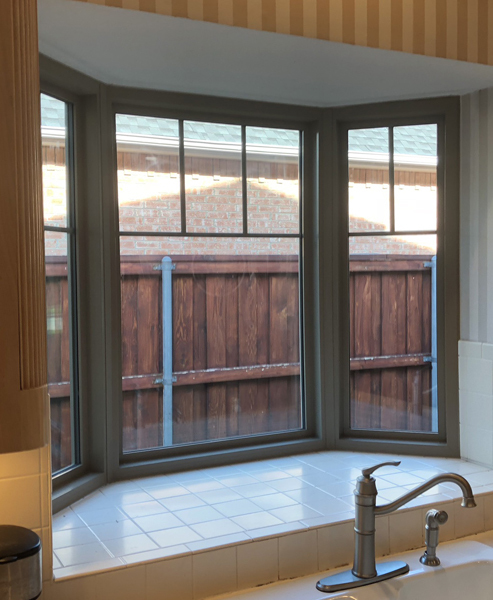 A bit of a specialty item and certainly not available from all vinyl window installation contractors, it's a special look for narrow and small windows that adds a lot of glass and minimizes frame size. They do use the Cardinal 366 Low E Glass and it does have a bit of the greenish tint to it but the performance and the overall look is spectacular. It's also a product that really is designed to look great for decades with a full lifetime warranty. We use these in sidelites and smaller transome windows sometimes but our recommendations are always based on the individual home, it's value, the customer's anticipated time to live in the home and the neighborhood as a whole. We are not a one size fits all replacement window contractor. We do in fact offer ten different window manufacturers with three to five window models from each. We sell wood, vinyl and aluminum replacement windows and offer exterior finishes in numerous colors on several of our vinyl window products. Expertise.com names us a top 16 of 313 window installation contractors. We are proud to have the very best reputation for quality of install in North Texas. In fact, we were named a top 16 window replacement contractor of the 313 available in 2017 by Expertise.com. Quality of workmanship and skill are by far the biggest and most important variables in vinyl windows. We have more awards, more expertise, better reviews and a better reputation to protect than others and we take that very seriously. The truth is we need your referrals and your endorsement when you talk to neighbors, family and co-workers about replacement windows. By doing better work we assure that and in fact, it's why we only take on ten to twelve projects per month. It's a way to assure quality and personalized service to the wonderful customers and the amazing high end homes that we work on. Remodeling Magazine publishes a yearly report called the "Cost vs. Value Report". It puts the average cost of windows in Coppell at around $940 each installed. This is a median number between the super cheap at $450 each and the super expensive ones at $2000 each. It also puts their added value to the home at around $760 on average. Alside, Mezzo, Coppell, Single Hung, Double Hung, Picture Window, frames, frame, sizeContact Us! Aluminum windows were used from the 70's through the 90's in Coppell for one reason. They are cheap windows. Builders like that. They warranty a new house for one year and to spend a dime more on a window that will last longer is not an agenda item. After a few years the glass fogs, the windows settle, the weatherstripping that was thin at first is worn out and for the most part they leak air terribly. Glass in one is half the thickness of a good quality vinyl window at 7/16" overall thickness and they used single strength glass instead of the double strength that is 30% thicker used in modern mid range type vinyl windows. Overall they are built to be cheap and perform accordingly. After they've been in place for fifteen or twenty years they really have used up their intended life span. This is what we usually tear out of a home to install vinyl windows. It is also so conductive of heat and cold that the temperature outside is usually the temperature of the frame on the inside of the home. 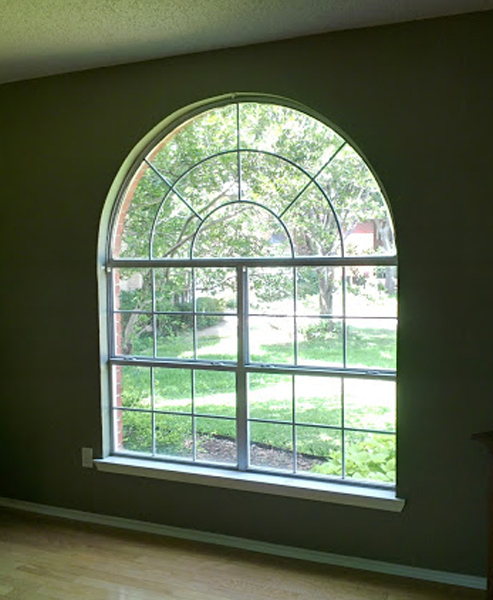 cheap windows, builders grade windows, fogged glass, CoppellContact Us! This is an in progress installation. The picture is there to show that the color of the glass is really not noticable for the most part. The two windows at the bottom have Low E heat reflective glass with Argon Gas filled insulated glass but notice there is very little discernable color with the half circle that is completely out at this point in the window installation. 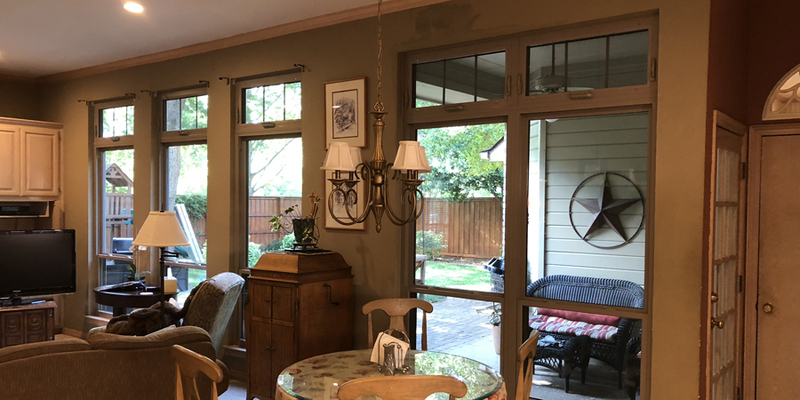 This project used the Alside Mezzo Single Hung Vinyl Replacement Window and was the case in point for our blog on heat conduction and convection through windows. 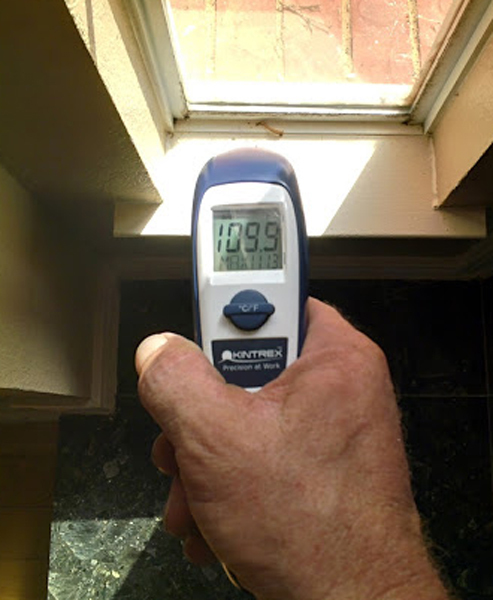 Heat conductivity through aluminum and vinyl replacement windows. We also take special steps that no one else takes. While this window is out we have access to the corners of the half circle. Usually these have no insulation in them and we take the time to spray foam that sheetrocked triangle above the window corners of the half circle to insulate and make that area more energy efficient. In this case it's almost nine square feet of your wall that isn't insulated and lets heat and cold pour through the wall itself. We try to solve that problem while the window is out and are the only company that takes that level of caring and concern to every jobsite. On this home we were working on a 93 degree day and the frames and walls and sills around the window at the time of install were 108 degrees at the time of testing as the west sun was beating down on the original windows. window, windows, installation, installers, contractors, manufacturers, Coppell, TexasContact Us! Double Hungs have worse performance, are less water hose friendly, leak more air and have a huge frame that comes in at 3 3/4" thick from brick to glass line. That can make a center mullion that is 7 1/2" thick. It's pretty massive and it tends to look cheap. Also, most of the contractors that use the Mezzo Double Hung Vinyl Replacement Window do rebranding to prevent cross comparison and tend to have really terrible reviews on their installation teams. Installation is the single biggest and most important variable in any replacement window project. A good installer can make a cheap window perfom well but a bad installer can make even the best of windows not perform correctly through lack of knowledge and attentiveness to detail as a whole. This product in a single hung has a fully extruded aluminum screen that slides up and down without removal for easy cleaning of the sill and access to the glass from the outside and also makes it easy to run an electric cord out of the window and the screen for Christmas lights and weedeaters and other sometimes necessary access point items. This one as a bay window was substantial enough to look strong and updated without losing too much glass and the grids added a nice country feel to the kitchen window. Alside, Mezzo, vinyl, replacement, window, windows, Single Hung, Double Hung, Half CircleContact Us! This sticker tells us a lot. It tells us that the window is Energy Star Rated and Approved throughout the United States but it also says its better than most. Energy Star Ratings require the SHGC and the U value to be .30 or lower. This beats that hands down. The U value at a .27 is better than a Double Hung and the Solar Heat Gain Coefficient (SHGC) is at a .19. There are very few products that are affordable and come in with these types of numbers. None that are locally made. Very few that aren't at least a thousand dollars each installed. We are proud to offer products and expertise that come in with well above average reviews and performance. We strive to find the very best value points on replacement windows. window, reviews, performance, data, Alside, Mezzo, vinyl, replacement, windows, Coppell, TexasContact Us! This is one of the most amazing aspects of a vinyl replacement window. This is the builders grade aluminum window on a moderate day. It's only 93 degrees outside in the shade. A pretty mild day for Texas. This laser guided thermometer is pointed at the window sill about 3 inches inside the window itself. As you can see it's almost 110 degrees inside the house and that heat is what is costing you money and making you miserable. It's a similar effect in the Winter time. 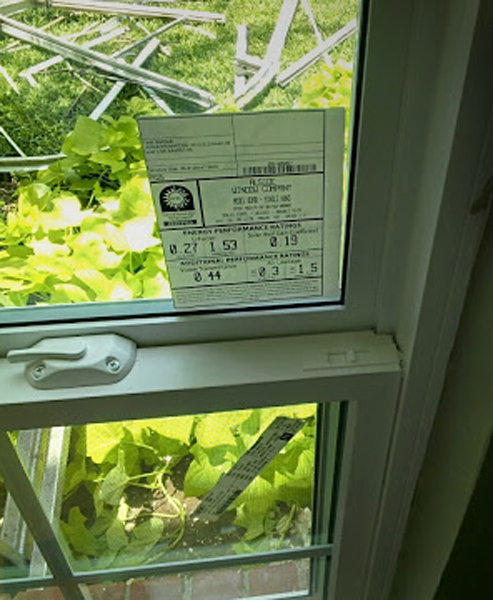 Once the window is replaced this reading went down to 77 degrees. Exactly the same as the room, the walls and the carpet in the home. It's seldom talked about but if your air conditioner works half as hard, it can last twice as long. Also, the added comfort to the home by making all areas and rooms the same temperature is an increase in the quality of life that is hard to put a price tag on. Overall our goal is to save you energy dollars and make the home go up in value enough to pay for the windows with the added bonus of you being comfortable for many years in the meantime. heat through windows, heat, cold, conduction, convection, builders grade, window, windows, replacement, Coppell, TexasContact Us! 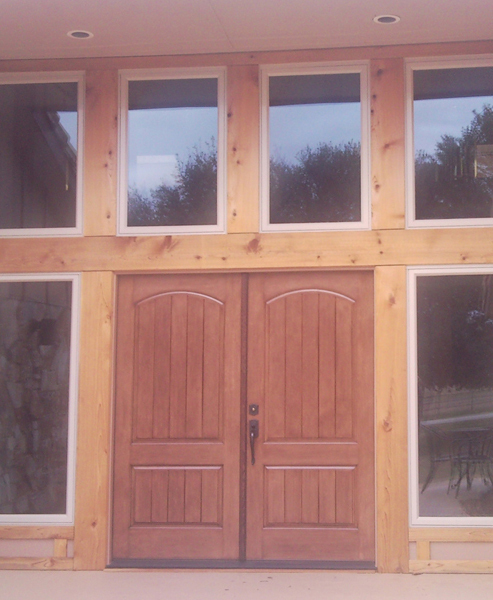 Exterior Doors Are Another Of Our Specialties. We are proud ot offer doors from Pro Villa and from Thermatru for your exterior residential door needs. Heads and shoulders above the quality of the big box stores at a very small added cost and an installation teqnique that is beyond stellar. As an installation contractor we serviced 17 Home Depot stores and 8 Lowe's stores from 1999 to 2002 and we know all of what they have to offer. There is a reason that big box stores have doors that only last a matter of years and we're very proud to offer longer lasting, more durable, more airtight doors than anyone in the Metroplex. 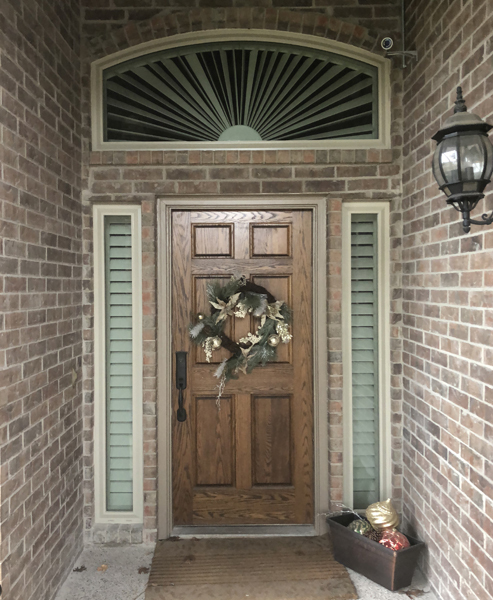 Thermatru is our favorite by far and their website offers literally hundreds of different options for your front door or your back door. Offered in steel, smooth fiberglass and this one in a textured fiberglass, they are affordable and last for decades when installed properly,. We find as a rule, most home improvements that fail or need to be redone find themselves in that position due to a bad install. We are happy to provide the very best installs availabile in North Texas. Exterior, residential, front, back, door, doors, Thermatru, Provilla, installation, installers, install, installs, contractor, contractors, quality, workmanship, carpentry, carpentersContact Us! Our reviews of Alside Mezzo Vinyl Replacement Windows and Doors.